PB Weir substation copper earth tape kits provide safe & secure high voltage connections to dirty or heavy oxidized copper/aluminum earth bars, stubs or stranded conductors, ranging from 25x3mm to 100x6mm and meet ENA technical specifications 41/21. The type 1 temporary earth kit is fault rated although not specifically fault rated, has been tested at 15 kA/I sec short current rating and for a continuous current rating of 300A. It consists of Clamp Type CE57 and associated two part operating pole. The clamp is supplied with two 8 metre long 50sq mm aluflex leads and a CE20/2 earth end clamp. It is suitable for application to clean or oxidised aluminium or copper tape 25-100mm wide. The operating pole is supplied in two 0.6 metre sections. The top section is fitted with an OL1 operating socket which engages with the CE57 clamp. The top section can also be used on its own or fitted to the bottom section to extend its total length to 1.2 metres. The use of either will depend upon the application and on the operator’s preference. 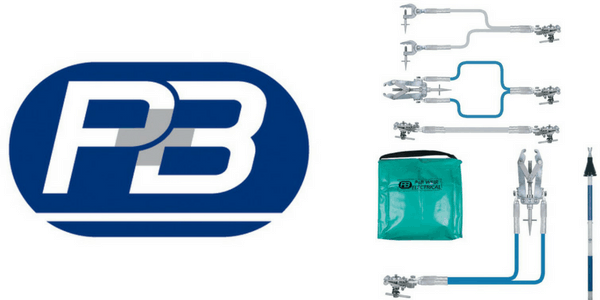 The Type 2 approved Earth Bond is rated 17.5kA when used with one lead and 31.5kA when used with two leads. Type 2 consists of a CE20/2/A/S/RT and a two part hook type operating pole. These are used with CE20/2 Earth End Clamp and one or two ESI-C1-2T1 earth leads. The clamp is suitable for application to clean or oxidised aluminium or copper tape 3.2-6.5mm thick and 38-50mm wide. The operating pole is available in two lengths, of 2 metres and 1.5 metres. These poles comprise a common top pole with two alternative bottom sections. The use of either length will depend on the application and the operator’s preference. The CE20/2/A/S/RT clamp is similar to the standard earth end clamp CE20/2, but is operated by means of a ring ended operating screw. 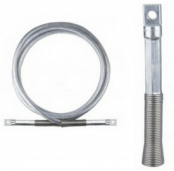 The pole has a retractable hook end which engages with the clamp operating screw. The hook end distinguishes the pole from the other operating poles, which are used to apply portable primary earths or earth drains. The clamp should normally be applied with the pole hook in its intermediate position, although the fully retracted position may be preferred for application at ground level. The CE20/2/A/S/RT clamp may be used with one or two leads type ESI-C1-2T1. Also, the clamp is similar to that of a standard earth end clamp and the same safeguards apply, i.e. 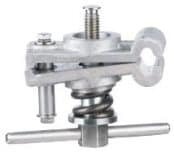 the clamp springs should be fully compressed when applied. ➡ See Overhead Line & Conductors for technical specifications on transmission and distribution power lines working at high/extra high voltages (HV EHV). 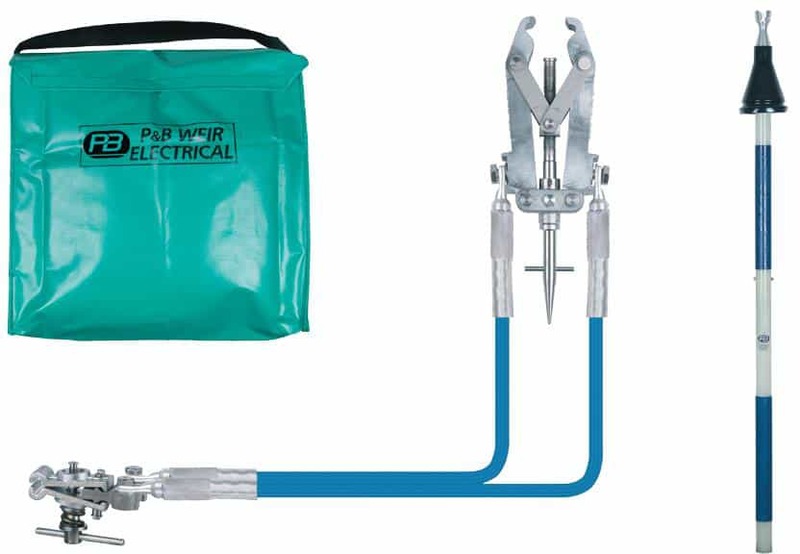 Portable Earthing Kits & Clamps for MV HV EHV Substation and Overhead Line Equipment.